While being a parent is a life-changing experience, it’s also very expensive. You can offset those expenses by creating a list on some of the best baby registry sites to let friends and family what items you’d prefer for your new baby. This is particularly helpful if you’re having a baby shower. Babies need various items as they start their lives. Using one of the best sites for a baby registry lets friends and family buy the items you need. But even if you’re not having a baby shower, it’s wise to start a registry so people know what to buy for your little one. There are a lot of stores where you can create a baby registry. However, where you register depends on what you need for your newborn. Each baby registry site has their own area of specialty. Some stores only carry specific brands, while others offer coupons and free baby stuff to start your new journey. As you consider where to start, know that both physical and online stores let you create baby registries. You can also create multiple registries if a certain store doesn’t offer a product you want. If you need ideas, here are the seven best baby registry sites to use, along with the top items for a baby registry. Amazon likely offers the world’s biggest selection of items. This not only includes books and electronics, but it also includes plenty of items for your baby. This makes Amazon one of the best baby registry sites to use. You also receive a 15 percent discount on eligible items if you are an Amazon Prime member and complete your registry set-up. If you don’t belong to Prime, you receive a ten percent discount. If you have bigger, more expensive items on your list, Amazon allows you to do group gifting. This lets multiple people contribute to a gift rather than one person footing the bill. This is a unique feature that you don’t see with most baby registry places. This option may help you receive a few of your more expensive baby items like a crib, car seat, or swing as a gift. Most people are familiar with Amazon, making it one of the best baby registry sites to use as you prepare for your newborn. If you love to shop at Target, you definitely want to consider creating a Target Baby Registry to get items for your new baby. Target has over 1,800 locations across the country, according to their website. If a baby gift item doesn’t fit or you want to exchange it, you shouldn’t have an issue finding a store to return the item. Target has all the big name items for a baby registry including Johnson’s, Huggies, and Fisher Price. Target gives you an entire year to exchange or return any registry items. If you create a baby registry and have items left on your list eight weeks before your baby’s expected due date, you can receive a 15 percent discount through Target. Like Amazon, you receive a free welcome kit when you create a baby registry. Just go to any Target guest services to get a free welcome kit that has over $100 worth of coupons and samples. Also like Amazon, Target has group gifting and universal gifting options so you can list gifts from other stores on your registry. You can even customize your registry page to keep track of who gave what and whether you’ve thanked them or not. Walmart is not just an affordable place to shop for groceries, clothes, and household items. It also offers a lot of items for new and expecting parents. Walmart provides you with a free welcome box when you set up a baby registry. Their website has different options for baby shower invitations and thank-you cards for all the people that use your Walmart registry to get your gifts. Guests can also leave personal messages which is a nice touch while you’re opening their purchased baby registry items. If someone can’t make the baby shower and they want to ship you something instead, Walmart offers free shipping on orders over $35. If you need to make a return, Walmart takes back baby registry items free of charge. In true Walmart fashion, they also have price-matching to make sure you and your baby shower guests get the most bang for your buck. Buy Buy Baby is a baby supply store, and is one of the best sites for a baby registry. The company does give you a welcome kit containing coupons and samples but you must pick it up from a physical store. This shouldn’t be too difficult as Buy Buy Baby has stores in 38 states, according to their website. Buy Buy Baby has a referral program that offers $25 off a purchase of $100 or more for anyone who successfully refers someone to register with Buy Buy Baby. If this is your first time setting up a registry, you can invite friends to suggest things you may need. You can also set up a baby registry consultation with an associate from a store location. That way, you will get a better idea on what you may need for your child that’s on the way. The Buy Buy Baby registry program isn’t as robust as Amazon or Target, but the benefits of a physical branch make them worth considering. Babylist is another baby registry site that gifts you a free goodie bag when you create a registry. This free box allows you to try new products you otherwise may not have the opportunity to use. Unlike other options on our list, Babylist is not a store but a service that lets you collect items from multiple stores. This offers a one-stop service for your friends instead of sending them to multiple stores. Babylist sells some items but does not sell many items directly. Babylist also has a mobile app to make it even easier to create, edit, and manage your baby registry. You’ll receive a ten percent discount on any items left on your registry 60 days prior to your baby’s expected arrival day. However, this discount only applies to items sold by Babylist, not items from other stores. You will see a link displayed on your registry that will help you apply the discount to anything left you may want to purchase. If you want to wait until after your baby arrives, you can use the discount up to six months after your child’s due date. The cool thing about using Babylist is that you can add unique homemade gifts to your registry to support indie shops. You can also request favors from friends and family if you need help cooking meals, running errands, or need someone to walk your dog while you adjust to life with your newborn. As an added perk, you can use Babylist to crowdsource a college fund for your new child. Friends and family can contribute an amount they choose using a debit or credit card. You probably know Ikea as a top place for finding the best deals on home goods and furniture. The store is also one of the top baby registry places as you can create a registry at a store or online. Ikea randomly does giveaways and surprises for registry customers so you may find yourself with an extra item or two you didn’t expect just for setting up a registry. If something just isn’t working out or you didn’t end up needing it, Ikea gives you a full year to return it. You can also give your guests the option to give you a cash gift instead of getting a registry gift. This would be the perfect way to get some extra spending money at the store if you didn’t get everything you wanted. MyRegistry.com is similar to Babylist in that, they don’t have their own store but rather acts as a universal baby registry site. You can add items from any store to your registry with MyRegistry, regardless if they have a website or not. When you create a registry with MyRegistry, you download an “Add to my registry” button that goes in the toolbar of your web browser. When you visit an online store and see an item you like, you click on the button and it adds it to your registry. You can do the same thing if you’re in a store and see an item you like. By scanning the barcode of the item with the MyRegistry app it adds it directly to your registry. You also receive discount perks, but they vary by retailer so you want to ask before assuming you will receive the discount. Similar to Babylist, you can also request cash to buy your own items or deposit into a college fund. So, we’ve gone over some of the best baby registry sites to choose. One other thing you need to consider is which items you want to add to your list. This decision impacts which baby registry program you choose to use. There are so many options for items to add to a baby registry, but you want to select the items you need the most. You will likely buy some items on your own, so balance that with what to include on your baby registry. Brainstorm some of the most important things you need for your baby. This could include sleepers, t-shirts, blankets, socks, bibs, shampoo, bottles, or anything else. Don’t be afraid to add big ticket items like cribs, strollers, and car seats to your registry. Some baby registries have a group gifting option, allowing multiple people to contribute to the price of one item. Ask other moms you know if there’s an item for a baby registry that they wish they had or had more of once the baby arrived. Add that to your registry, too. Don’t think just short-term items, think three to six months ahead. Babies grow fast and you’ll be happy to have that toy or activity center already at your home. Don’t be afraid to have more than one registry if needed. Take advantage of the discounts websites to offer you for the items left over. There are various ways to get free diapers and wipes, so you may want to avoid adding those to your registry. Having a baby is an exciting time. It’s also very expensive. Don’t be shy by allowing your friends and family to show their love through purchasing items you may need. Every little bit they provide is an immense help for your budget. You have a lot of options when it comes to choosing the best baby registry sites for your newborn. Find one or more that works for your needs and let people know where you’re registered. Whether you have a baby shower or not, you should create a baby registry. It’s free, you’ll get discounts and free goodie boxes, and friends and family might want to buy you a gift. You might as well point them in the direction of what you actually want or need. Babies can be expensive, so a registry is a great way to save money. Any of these options listed above can help you cut costs. What baby registry items do you feel are important to add to a list? How can you save money on a newborn baby? What are some other places for a baby registry you’ve used in the past? 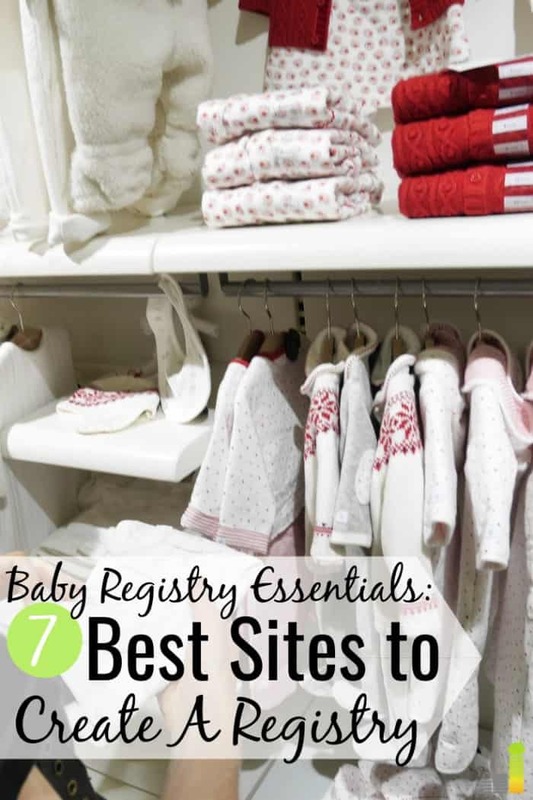 The post 7 Best Baby Registry Sites and How to Build Your List appeared first on Frugal Rules.